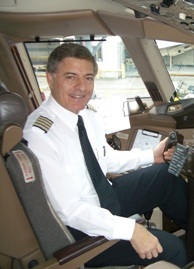 Captain Michael (Miki) Katz who is a senior Boeing 777 Captain in ELAL Israel airlines is the founder and the host of the Relaxed Flight Seminar that gained international reputation in Europe, Israel, the US and the UK. Miki is a fear of flying expert since 1993. Fear of flying affects the life and opportunities of many people. Miki is a popular consultant and lecturer amongst airlines and other organizations, in the field of traveler's tensions and fear of flight. He is on the board of the First International Conference on Air Travel and Health on November 2006. Miki is the chairman of the Psychophysiological and fear of flying workshop in the conference. Some of his articles concerning fear of flying were published; among them "the difference between claustrophobics and other fearful flyers" (see references). Captain Katz holds an MBA and MPA degrees. He was invited by a leading University to join a research program on fear of flying for Ph.D Psychology.